Through fire and blood, they run toward terror - Now they need our help to heal. Truck rams into pedestrians in Jerusalem in a suspected terror attack, injures at least 15. It doesn't get much closer to doing the mitzvah of kindness to victims, chesed shel emes, yourself than this. 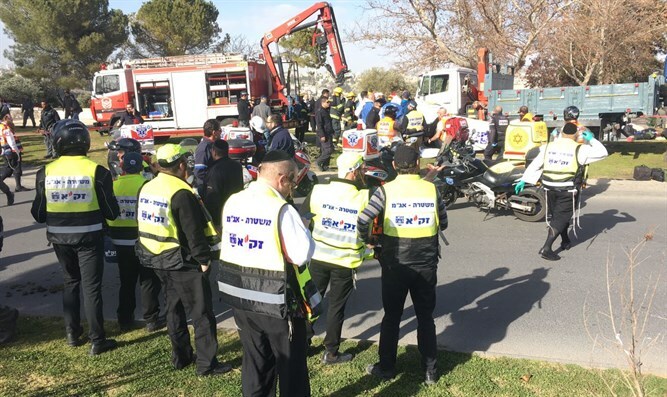 This afternoon, a truck rammed into a group of soldiers on a promenade in the Armon Hanatziv neighborhood of Jerusalem, killing at least four of them, and injuring at least 15 more in yet another brutal vehicular terror attack. Once again, just hours ago, as people ran from the scene to save themselves, ZAKA volunteers ran the action to see how they could help. The volunteers are on the scene as this is being written, and will be transporting the bodies of four Jews who died far, far too young. If you are waiting for the time to support ZAKA - The time is now. How they will move on is their own personal journey. But how the organization will move on, how they will continue to have the resources they need to continue to do their work in each gruesome scene of terror, depends on the response of people like us who choose to give. Please join ZAKA in their work, and give what you can.